Quickly secure a camera or binoculars to your backpack with the made in the USA, set of 2, black Reporter/Backpack System Connectors from OP/TECH USA. 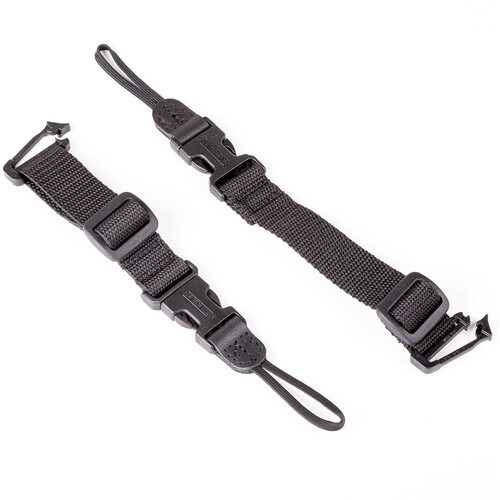 The Uni-Loop connectors and rugged clips easily attach to another strap or backpack strap. Each side is adjustable from 8.5 - 10.5". The set has one female and one male Uni-Loop. For strength and durability, the connectors are constructed from nylon webbing, hard plastic, and leather tabs. The connectors attach to any 1" wide webbing or seamed area. Box Dimensions (LxWxH) 5.0 x 1.5 x 1.0"
Reporter/Backpack System Connectors (Set of 2, Black) is rated 4.7 out of 5 by 31. Rated 5 out of 5 by CP93 from Great way to extend the OpTech system Got fed up with the old school neckstraps and decided to research various sling type systems. I settled on the OP/TECH system for a number of reasons including price point, mounting (lugs vs tripod socket), versatility/extensibility. and reputation, and am very glad I did. I started with just a sling and wrist strap, and have now extended my options to include being able to use the same mounting points with my backpack camera bag through the use of these system connectors. They're strong, easy to mount, and reliable. Rated 5 out of 5 by Mike from Compatible with Op/Tech Camera Straps I love my Op/Tech Super Classic Strap for my camera. It's the most comfortable shoulder strap that I've worn. But when backpacking, camera straps and backpacking harnesses sometimes get in the way of each other-- especially if you have a hydration line coming out of the backpack. The nice thing about these backpack connectors is that they have the same buckles as my Op/Tech camera strap. So I can unbuckle the top half of the strap (the part that wraps around your shoulders) and buckle the camera directly to these instead. It's quick and convenient. Rated 5 out of 5 by northshorehiker from Critical piece of gear while backpacking I do a fair amount of backcountry photography, logging some long days on the trail. These connectors, combined with the Op/Tech Stabilizer Strap, allow me to carry my camera rig where it's very quickly accessible, without any additional weight on my neck. When I shed the backpack, I just unclip the camera from the backpack and re-attach my Op/Tech shoulder strap. Highly recommended. Rated 5 out of 5 by Code Mentor from My Perfect Solution I needed an alternative to carrying my camera on my neck using a traditional camera strap but I wanted to have the security of the traditional camera strap. The Op/Tech connector set allows me to use my traditional camera strap and provide security while taking pictures and also use the Connector Set to secure the camera to my backpack thereby taking the weight of the camera and lens off my neck. Rated 5 out of 5 by Anonymous from Excellent for Carrying a DSLR/MILC While Backpacking I'm a backpacker and like to keep my camera ready to use at any time. I purchased the Op/Tech System Connectors to support my camera from the pack straps instead of my neck. The Op/Tech system Connectors did the job exactly as expected. Parts that connect to the pack straps are secure but removeable so I can readily transfer them from my backpack to a day/camera backpack. Rated 5 out of 5 by Whistler girl from Great for hanging camera from backpack straps I have a few camera bags that I attached sets of these to so when I hike and want the camera easily accessible but not swinging freely as it would on a sling strap or normal strap, it is there. Works really well. I set up all my cameras with Op/Tech straps so I could easily move from one strap system to another (including the reporter straps), and it works really well. Also when using the reporter straps the weight of the camera is completely off my neck and absorbed by the backpack. Rated 4 out of 5 by Bradford H. from Great Product I currently have these connected to my day pack. I have yet to truely test them out, however so far they have worked as described. I have also just ordered another set for other packs to keep from changing out the straps. I will use the Uni-Loops on other cameras (also ordered an extra set of the Uni-Loops. Due to back problems I'm looking to using the 2nd set to attached a ez access bag to the front of a backpack. Rated 5 out of 5 by Adirondack Al from great buy for the money! I have been using these on my snow suit and bib pant suspenders for years. I don't use them for my telephoto camera setup as it's too large, I'm sure a normal lens and dslr would be no problem. I basically use them for binoculars. All my gear has the Op/Tech loop style connectors attached. They have never failed me.